MONTEREY, Ca. - For a second consecutive time, the Audi Certified Champion RS 6 team has claimed the Manufacturers' Championship in the SPEED World Challenge GT Series competing with a pair of Audi RS 6 "Competition" cars. In Audi and Champion Racing's five-year history in the GT series, today's result brings the total of Manufacturers' Championships to three including the year 2001 when the team won their first Manufacturers' Championship with a pair of Audi S4s. Note: For more information on Audi Certified pre-owned, visit www.audiusa.com/certified. For more information on Champion Racing, visit www.championracing.net. 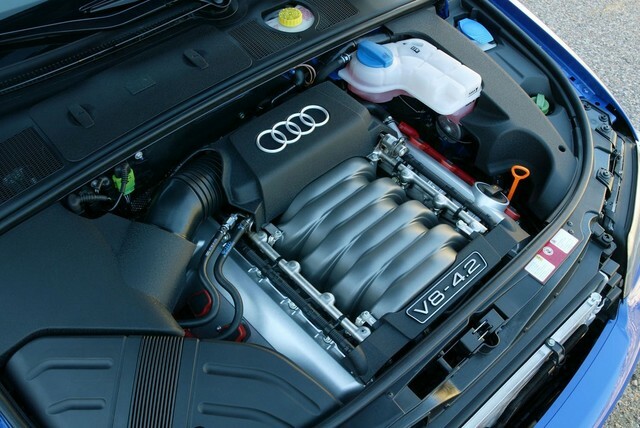 AUBURN HILLS, Mich. — Driving enthusiasts seeking pulse-quickening high performance have a new fix available: the 2004 Audi S4 sedan and Avant with a throaty 4.2-liter V8 engine. Big in both style and substance, the new S4’s offer the first V8 in their segment for supreme, even development of power and torque and unmistakable dynamic handling. DETROIT, 2004 NAIAS - Another Audi sports model with a strong personality is about to leave the starting grid: the Audi S4 Cabriolet. It combines the acknowledged qualities of the Cabriolet with the powerful V8 engine from the Audi S4 and the safety of the quattro driveline. Restrained visual changes underline its sports character. We've just added new regional forums for enthusiasts from around the globe. We encourage you to use them to make other enthusiast contacts near you and perhaps you can form an enthusiast group if o­ne is not already active in your area. We ask that you keep all general model related discussions in the main model topic forums so everyone has a common venue for discussions. The regional forums are a great place to discuss 'local' service facilities and local events and such. If you live in an area that is not yet represented by a regional forum, please send us an email at support@s-cars.org and request a forum for your region. We'll be happy to set something up for you. Enjoy! WE NEED YOUR HELP NOW IN SAVING AND PRESERVING THE HISTORICAL 1950-1952 ROAD RACING COURSE AROUND ELKHART LAKE WISCONSIN. The fight started when the Sheboygan County Highway Department invented a “make work” project that would destroy most of the original course. “Hamill’s Hollow” will be destroyed with the design. Hills are to be moved to fill in wetlands, curves to be straightened, and natural kettles to be flattened. Mature trees are to be removed and the road and right of way altered to look like the two-lane portion of WI Hwy 57 or I43. Our mission at S-CARS.ORG is to strengthen the world S & RS CAR communities by providing a knowledge base of owners and enthusiasts from around the globe. We offer the web's best S-CAR Classified listing as well as a number of questions and answers (see also our sister site, UrS4.COM). It is our goal to keep the site clean and logically organized while bringing you interesting content without all the "noise" associated with other sites. AUBURN HILLS, Mich. - With its first-ever entry in North America, the 2002 Audi S8 offers the discerning customer a perfect synthesis of a luxurious atmosphere and superior power. The combination of unique technical features such as the all-aluminum Audi Space Frame (ASF), the quattro permanent all-wheel-drive system and the high-tech five-valve V8 engine, makes Audi’s top-of-the-line S8 a leader in the field of automotive construction. Audi of America press release. With its S8, Audi offers the discerning customer a perfect synthesis of luxurious top-class atmosphere and superior power. In combination with unique technical features such as the all-aluminium Audi Space Frame (ASF) and the quattro permanent four-wheel drive system, this makes the top-of-the-range model from Audi a leader in the field of automotive construction. The equipment and data specified relate to the model range available in Germany. We reserve the right to make changes. Errors and omissions excepted. It all started on the rally scene. The concept of Audi's S models is deeply rooted in the marque's motor sport activities, which caused a sensation in the early 1980s. With extremely powerful five-cylinder turbocharged engines and permanent all-wheel drive the "Rally quattros" shook off all their competitors. The 1982 manufacturers' world rally championship, the 1983 drivers' world championship, a hat-trick victory in the 1984 Monte Carlo Rally and victory in the manufacturers' and drivers' world championships in the same season were notable milestones in the marque's motor sport history. In 1985 the world of motor sport had its attention drawn for the first time to an "Audi S". This was the Audi Sport quattro S1 in which Audi driver Michèle Mouton won the legendary Pikes Peak hillclimb in Colorado, USA. Walter Röhrl and Bobby Unser repeated this spectacular Audi success in the two years that followed.